10 Healthy Pantry Staples for the Busy, Hungry, Sweet Tooth in You! When I was graduating high school and getting ready to enter university, I can’t even tell you how many people warned me about the “Freshman 15” (aka, the 15lbs of fluff you’ll inevitably pack on during your first year in college). At the time, I had just recently quit veganism because I was doing it the unhealthy way (eating tons of fruit and bread, and not an ounce of protein, leaving me lethargic and ravenous around the clock). I quickly hopped online and searched, “Healthy Pantry Staples.” Yeah, I got a lot of search results, but nothing that really suited me. You see, I’ve got a sweet tooth. ONE MAJOR HELLUVA SWEET TOOTH. I eat cookies for breakfast and cake for dinner on the regular. So when I saw article after article recommending eating lots of beans, canned tuna, brown rice, and spinach, I kind of gagged a little. No I’m kidding, but for real, I felt lost and confused. It felt like having a sweet tooth was contraband. Like eating frosting straight up would be the death of me. If this sounds like you, then HIGH FIVE! We’ve found each other and we can get through this together. Sweet teeth, UNITE! 9 Healthy Pantry Staples for the Busy, the Hungry, and the Dessert-Addicted! 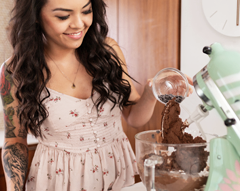 As a healthy dessert blogger, lifelong chocolate lover, and nutrition junkie, I obviously had to kick this list off with CHOCOLATE — one of the most commonly used, beloved ingredients here at Desserts With Benefits. While unapologetically high in calories and fat, these are good calories and good fats people. Dark chocolate is rich in antioxidants, may reduce blood pressure, and just makes you damn happy. So go ahead and EAT IT. Dark chocolate is definitely an acquired taste that took me years to get used to. I couldn’t stand it until I turned 22, I think? Deep down, I’m a milk chocolate and white chocolate lover, but I know those aren’t healthy options… unless it’s Homemade Milk Chocolate and White Chocolate! At the moment, the highest cacao percentage I can tolerate is 70%. But I’m getting better. Back in college, I couldn’t even handle 60%. Who knows, maybe five years from now I can graduate to 80% cacao chocolate. If you’re like me (aka, a dark chocolate wimp), try making these Peanut Butter and Dark Chocolate Shortbread Bars. They have been one of the most popular recipes on the blog since I posted them YEARS ago, and for good reason. These bars, my friend, will make me eat dark chocolate without any hesitation. 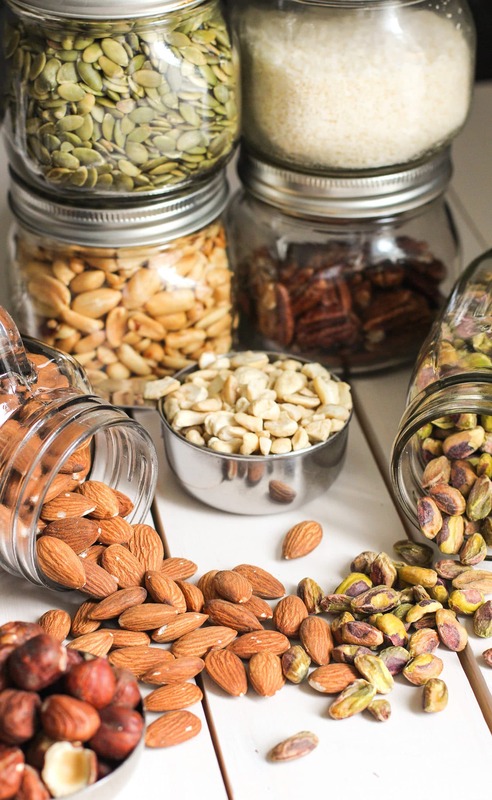 Nuts and seeds are jam-packed with nutrition. They’re dense with energy, vitamins, minerals, and antioxidants, plus fiber and a bit of protein to keep you full and satisfied. No matter which one’s your fave, you’ll be doing yourself a goodie by snacking on a palmful, sprinkling some over Oatmeal Raisin Cookie Overnight Oats, mixing a heaping cup into Healthy Banana Bread before sending it off into the oven, and so on. My favorite nuts include roasted, salted peanuts and cashews. I’m just starting to like pistachios. I’m not a huge seed snacker, but I do love love love tahini (ground sesame seeds). Pictured here, we have raw pumpkin seeds, shredded coconut, cocktail peanuts, raw pecans, raw cashew pieces, raw almonds, toasted hazelnuts, and raw pistachios. These crunchy itty bitty seeds might look like tiny pebbles or a chunky sand, but they’re edible, and they’re so so so so soooooo good for you. Both chia and flax create a gel when mixed with water, so they act like an egg replacer in some recipes. This gel is created from the soluble fiber within the seeds, which helps slow digestion so you stay fuller for longer (oh, and it can help you stay “regular” — wink wink). 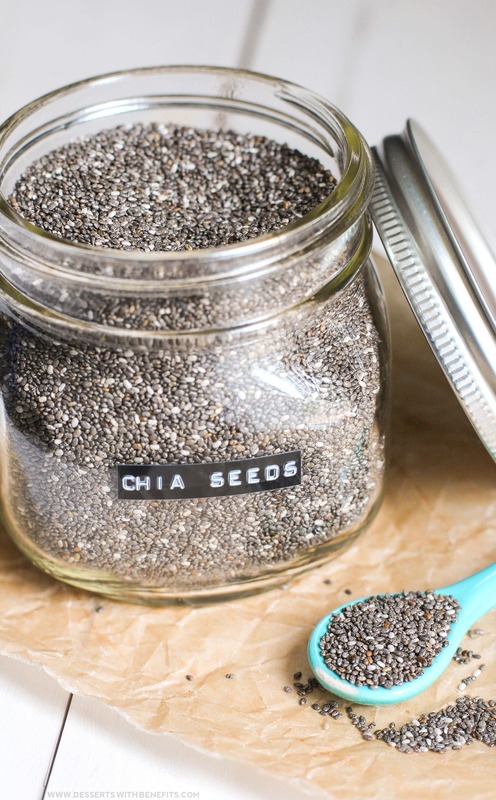 My favorite way to eat chia? In this Strawberry Vanilla Chia Seed Pudding. My favorite way to eat flax? In this Single-Serving Microwaveable Buckwheat Banana Cake. When I started baking around 7 years ago, I used typical baking ingredients — bleached all purpose flour, refined white sugar and brown sugar, even corn syrup and artificial food dyes. When I discovered vegan baking, I was completely enamored (it was what inspired me to go entirely vegan). Unfortunately, as I mentioned above, I didn’t do my research and eat a healthy, balanced vegan diet. Just because Oreos are vegan doesn’t make it good for us. I was “that” vegan who would eat tons of sugar, white bread, and candy. Feeling tired, lazy, and constantly hungry isn’t right. I realized I felt that way because of the food I was eating. I then discovered baking using whole grains. I started developing my own whole grain baked good recipes, and slowly, over time, I also managed to cut down on the amount of sugar and oil used too, all while keeping the final product light, fluffy, sweet, and delicious. Whole grains are far less processed than white flour (all-purpose flour, cake flour, bread flour). They’re not stripped of their fiber and nutrients like white flour (did you know that white flour is processed even further to chemically add back in the minerals they were just stripped of?? ), so whole grains will fill you up and keep you satisfied for hours on end. Eating a muffin made with white flour rather than whole grains will likely make you hungry for another muffin in 15 minutes flat. 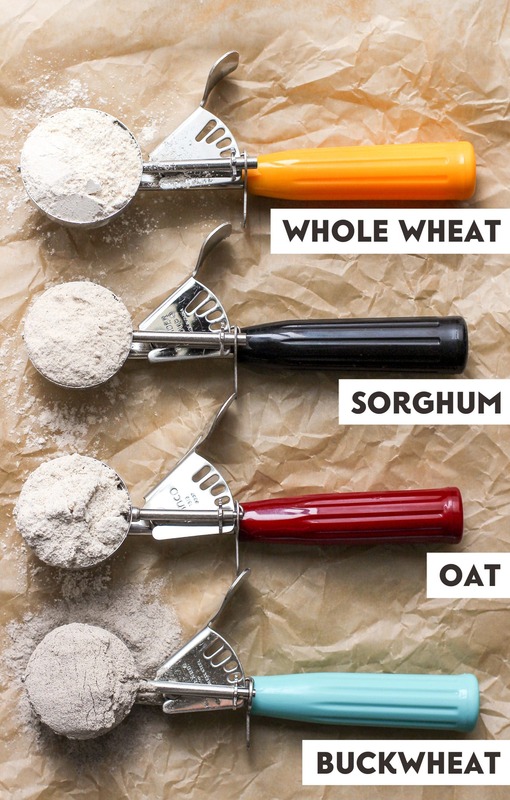 My pantry is stocked full of whole grain flours, from buckwheat flour to brown rice flour to oat flour to sorghum flour to whole wheat flour (I use certified gluten-free rolled oats and oat flour when I bake for those with celiac disease). 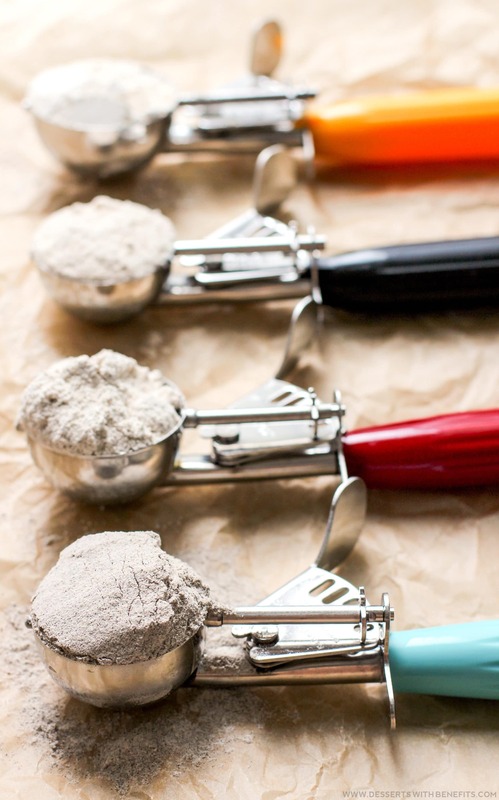 Who knew so many foods can be turned into a flour? We’ve got almond meal, coconut flour, peanut flour, soy flour, even quinoa flour. Better yet, all of these can be used to make dessert — sweet, sweet, oh so sweet DESSERT! My favorite recipe using coconut flour? This Single-Serving Funfetti Microwave Cake. My favorite recipe using peanut flour? This Gluten-Free Chunky Monkey Cake. My favorite recipe using soy flour? These Low-Carb Gluten-Free Cinnamon Rolls. My favorite recipe using quinoa flour? These Vegan Gluten-Free Matcha Green Tea Blondies. -Sucanat: Minimally processed cane juice. It still contains the natural molasses in the sugar cane and looks a bit chunky from not being refined to the bone. Sucanat offers a very rich “brown sugar” flavor that works great with chocolate and recipes with spices, like pumpkin recipes. -Coconut Sugar: Coconut sugar is a lot like brown sugar — it’s soft, packs like brown sugar, and caramelizes remarkably well. -Date Sugar: Simply dried, ground dates. -Maple Sugar: Simply dehydrated maple syrup. -Honey Crystals: Simply dehydrated honey. -Stevia Extract: Liquid stevia extract may come in a small bottle but it sure is mighty! One small teaspoon has the sweetness of a whopping one cup of sugar, all for zero calories and zero sugar that won’t spike your blood sugar levels. Because of stevia’s potency, it’s very easy to use too much, causing the recipe you’re making to be overly sweet with a bitter aftertaste. Thankfully, all of my recipes using stevia are tried and true, so you won’t have to deal with that aftertaste like I did so many times during recipe testing. Just lookin’ out for ya! I use organic stevia in the plain variety, as well as the flavored — vanilla crème and English toffee are my favorite. -Erythritol: This sounds like a chemical, but it’s actually natural and comes from fruits and vegetables. 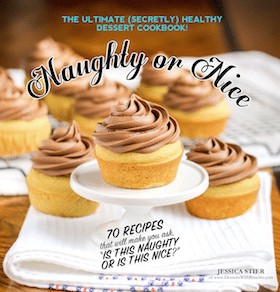 It comes in granulated and powdered varieties, perfect for baking and making frosting (I use organic granulated erythritol and non-GMO powdered erythritol). It’s also very low calorie and doesn’t affect blood sugar, so it’s a great option for diabetics. One cup has just 48 calories (while one cup of white sugar has 768 calories)! When I go to the grocery store I stock up on as many fresh fruits and veggies as I can. Because fresh produce has a short life span, I also grab the frozen varieties. I have entire shelves in my freezer stocked with frozen strawberries, raspberries, pineapples, blueberries, cherries, and bananas for when I haven’t had the time for a grocery run. I find that apples, lemons, beets, and carrots store for quite some time (in the fridge), especially compared to raspberries, avocados, and spinach, which start turning almost immediately. My favorite recipe using strawberries? This Strawberry Cheesecake Dip. My favorite recipe using blueberries? This Raw Blueberry Coconut Fudge. My favorite recipe using carrots? This Carrot Cake Milkshake. My favorite recipe using beets? Tied between Gluten-Free Vegan Red Velvet Cake + Red Velvet Frosting! My favorite recipe using spinach? These (Sneaky!) Berry Banana Shake. My favorite recipe using canned peaches? These Vegan Gluten-Free Lemony Peach Blondies. My favorite recipe using pumpkin? This Easy Pumpkin Pie Cheesecake Dip. My favorite recipe using black beans? These Healthy Brownie Batter. My favorite recipe using garbanzo beans? These Vegan Chocolate Chip Cookie Dough Fudge. Protein is essential for muscle growth, repair, and maintenance, and it is also necessary for maintaining blood pressure, fluid balance, pH balance, and electrolyte levels within the body. Here on the blog, I offer a variety of recipes with protein powder. 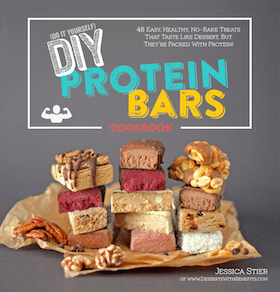 I like whey protein powder and brown rice protein powder (both are used in my DIY Protein Bars Cookbook). My favorite recipe using whey protein powder? These Peanut Butter Protein Balls. My favorite recipe using brown rice protein powder? These “Nutella” DIY Protein Bars. I truly hope you enjoyed this list of healthy pantry staples. After this hectic week, I’m off to the grocery store to get some goodies and I will be baking all week long! Do you have any additions to this list? Any favorite sweet and healthy staples I missed? Let me know below! Love love love this article – especially the pictures that go along with it! Seriously amped up my own sweet tooth just now and I’m only reading it. Haha. Dark chocolate and nut butters are my two favorites on the list. Great list! When starting to eat healthy I definitely think that stocking your pantry with healthy choices is the place to start. Got to be armed and ready with the right stuff!